The HiRISE instrument on NASA's Mars Reconnaissance Orbiter captured this image of layered deposits near the Red Planet’s south pole to take a closer look at a circular feature that might be an impact crater. Photo released April 4, 2017. The frigid region near Mars' south pole bears a striking resemblance to the skin of a finely scaled lizard in a new photo by NASA's Mars Reconnaissance Orbiter (MRO). 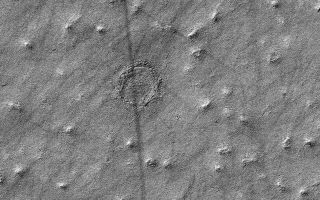 MRO's HiRISE (High Resolution Imaging Science Experiment) camera captured the image "to take a closer look at a circular feature that might be an impact structure on the South Polar layered deposits," NASA officials wrote in a description Tuesday (April 4). Objects on the Martian surface just 59 inches (150 centimeters) across can be resolved in the newly released photo, which has a scale of 19.7 inches (50 cm) per pixel, NASA officials said. The $720 million MRO mission launched in August 2005 and arrived at the Red Planet in March 2006. Over the past 11 years, the prolific spacecraft has been hunting for signs of past water activity, studying Martian geology and climate, scouting out landing sites for future robotic and human missions and relaying data from surface robots such as the Curiosity rover home to Earth, among other tasks. Since November 2006, MRO has been flying in a near-polar orbit whose altitude has ranged from 155 to 196 miles (250 to 316 kilometers). On March 27 of this year, the spacecraft completed its 50,000th lap around the Red Planet. The spacecraft and its six science instruments remain in good health, mission team members said recently.